RHINO PUMPS takes pride in our work. We have attention to detail when it comes to service. We realize that with rotating equipment it is the small things that matter. We never perform a start-up without the RHINO PUMPS 40 point checklist. This ensures that your pumping equipment performs as it was intended. RHINO PUMPS can perform any necessary service for end suction centrifugal pumps, whether it be installation, troubleshooting, laser alignment or balancing, we can help. RHINO PUMPS can repair any brand of vertical turbine pump in house. We exercise industry leading techniques to ensure the highest quality repairs. RHINO PUMPS shop services is ideal for fast turn around, and reliable repairs. This makes us an excellent fit for the high demanding industrial market. 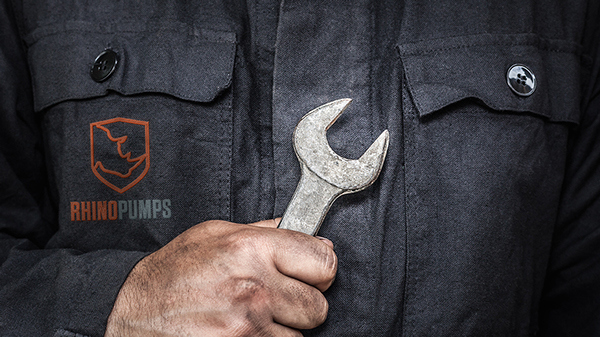 RHINO PUMPS can perform complete submersible pump repairs on any brand of pump. We can quickly diagnose and repair your submersible pump and have back and running in no time. RHINO PUMPS field services is second to none, our installation abilities are what set us apart from the competition. A proper pump installation is the difference in a pump that will last for many years and a pump that will last just beyond warranty. RHINO PUMPS pulls and sets our own well pumps, we are capable of installing and pulling well pumps of any size, whether that is an 800 HP deep well turbine pump or a short set booster pump, we are the preferred well pump service company. As the water demands continually increase, it is necessary to perform improvements on older designs. RHINO PUMPS can help with your designs, provide the equipment, and even install it. Are you having problems with an existing pump application? Give us a call today and see how we can help. Our expert staff will be able to quickly help resolve your pumping problems. RHINO PUMPS performs water well services including, well rehab, well videos, and well abandonment.